MLDRIN is a representative forum for First Nations in the Southern Murray Darling Basin, established in 1998 to create a united voice for water justice. Today, all our members stand in unity with communities rallying in six heavily impacted river towns, to call for urgent action to address the water crisis across New South Wales. 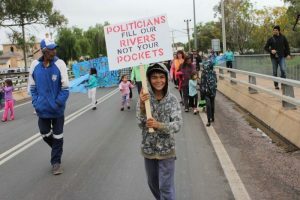 First Nations and river communities have been devastated by recent massive fish kills, toxic algae outbreaks and drinking water shortages throughout the Baarka (Darling River) and its tributaries. Aboriginal people have lived sustainably alongside these rivers for tens of thousands of years. The catastrophe we see today is not only an ecological disaster, but a breach of human rights and a threat to the continuation of cultural traditions recognised as some of the world’s oldest. Comprehensive and independent scientific studies have identified over-allocation of water for irrigated agriculture as a key driver for the decline of these waterways. For decades, First Nations have highlighted the dangers associated with water-intensive agriculture in the arid landscape of the Northern Basin. Yet successive NSW governments have sided with the big end of town, against the interests of communities and Traditional Owners. While this catastrophe is hurting First Nations people, it is also galvanising communities into action. The negligence of NSW and Australian governments has unleashed a wave of community outrage and action which is not going to end any time soon. The communities of Bourke, Dareton, Dubbo, Menindee, Walgett and Wilcannia are standing up today to send a message that resonates for all First Nations across the Basin. We stand in solidarity with the people in those towns. We applaud the work of local Aboriginal Land Councils and NSW Aboriginal Land Council in mobilising communities across this huge area. The governments of the Basin are on notice: take meaningful action to fix this crisis or you will be held to account. As communities rally today, the 2012 Water Sharing Plan for the Barwon-Darling is under review. This is the plan that allowed irrigators to pump huge volumes of water from the headwaters of the Darling and drain environmental flows for their cotton crops. This Water Sharing Plan needs a complete overhaul. We will work with First Nations in NSW to ensure that new Water Resource Plans and updated Water Sharing Plans, being developed now, provide meaningful protection for Traditional Owners’ cultural values and basic human needs. The Basin Plan was established following one of the worst droughts in recent memory, to address a dangerous imbalance in water allocation, which saw wetlands and billabongs dying across the Basin. Sadly the Plan has been undermined by powerful vested interests and their political collaborators. By uniting to fight for water justice, we can reclaim our rivers and restore the lifeblood of Country.